This document has been written to explain the different types of bow commonly available, to explain the basic components of different types of bows and to give some guidance intended to help make the choice for your first bow. The advice here is aimed at beginners and it should be noted that the cost of bows with the required accessories can range from low hundreds of pounds through to thousands of pounds for pro level equipment. When selecting your initial bow and accessories some professional advice and support is essential. It is absolutely not advised to buy your first bow online as opposed to visiting a shop, trying various options and having your complete package set up for you. Buying a bow at a shop should take a long time, with over two hours to try multiple options, select your bow, have it set up, arrows made and test firing. It is not uncommon for there to be long waits at popular times in shops and so it is advised to turn up early. As well as the advice given by shops there are a lot of regular archers in the club that have varying levels of experience and have tried out a lot of equipment. Most people are happy to show you their bows and to talk about equipment they like and equipment that did not work out for them. Ask nicely and people may well be willing to let you try some of the different equipment available. There are a wide range of possibilities buying your first bow from very cheap to very expensive and second hand equipment does not fetch good prices. If you buy a very cheap training bow and regularly attend to shoot you should expect to reach the limits of the bow very quickly and then need to spend more money buying a better bow. If you buy an expensive bow there are still some parts that you will probably end up replacing such as arrows and limbs as you improve and naturally move up to higher poundage limbs. The balance between equipment that you will quickly outgrow and managing your budget is down to the individual but the advice offered within this document is intended to provide a balance that gives a good starting point at a reasonable outlay. It is possible to buy used equipment from some shops and off Ebay. Reputable shops should have the experience to be able to inspect equipment they are selling and be able to offer advice but caution should be used when buying off Ebay as it will be in unknown condition and you are taking a gamble. Traditional (Budget £350+) – Longbows & flat-bows (or other traditional bows) are normally one permanently joined length of wood that can be made from either a single stave (piece) of wood or laminated (several types of wood strips glued together). It should be considered that these bows do not break down in to smaller pieces and can be over 6 ft in length making their transport and storage something to be considered. Good longbows or flat bows are more expensive than a reasonable recurve bow and cannot be upgraded. Typically shot barebow there are few expenses beyond the bow and arrows meaning that the overall price for a starter kit is similar to a recurve setup. Recurve (Budget £325+) – Whilst recurve actually refers to the shape of the bow it is commonly used to refer to recurve take down bows consisting of a riser with detachable limbs and accessories. There is a very wide range of parts available from budget through to professional. One of the advantages of a recurve bow is that the components can be upgraded in separate stages and without having to upgrade the entire bow at once. This type of bow is what most people are trained with and use as an initial bow. Compound Bow (Budget £1,225+) – technologically the most advanced type of bow designed for high arrow speeds and accuracy. These bows are intended to be left assembled but are significantly shorter than a long bow or assembled recurve bow. Compound bows have a number of developments and advantages over other bows including the use of peep sights for accuracy and ‘let off’ which greatly lowers the force required to hold the bow whilst aiming. Compound bows come with a finance warning in that they are not cheap to purchase and most accessories are also more expensive than for recurve bows. Compound bows require greater customisation to the archer and whilst there are now bows on the market that have a greater range of adjustments aimed at accommodating juniors as they grow, adult bows tend to have little adjustment in draw length (circa 3 inch) and draw weight (circa 10 lbs) without great expense. Barebow – As implied by the name, the bow is shot without any accessories such as sights or stabilisers and in some cases without arrow rests. Traditional bows are typically shot barebow but sometimes recurve bows are also shot his way. Typical Recurve – Under competition rules recurve bows can be fitted with an arrow rest a sight (unmagnified), clicker, stabilisers and weights / vibration dampers. As an initial starting point it is common to use a cheap sight, good arrow rest and sometimes a long rod with other accessories upgraded or added later. This is the most common style of shooting in the club. Typical Compound – Compound bows are subject to different rules to recurve bows and are normally easier to shoot with greater accuracy. Compound bows will commonly be fitted with arrow rests, front sights which can be magnified, a peep sign (a small sight inserted into the bow string) and stabilisers. Arm Guard £5 – from time to time (well quite frequently when you start out) the bow string will make contact with your arm. An arm guard deflects the string and prevents most of the pain and bruising. Arm guards are relatively cheap and available in a range of sizes. If choosing a compound bow choose an arm guard that errs on the side of big and well built! Finger Tab £10 – if shooting off the fingers (i.e. not a compound bow shot with a release aid) then a finger tab or shooting glove is required. The tabs are there for two main purposes, firstly to protect the fingers from the forces exerted by the bow string and secondly to help the bow string pass smoothly off the fingers with minimal friction. If possible, try out a few different styles to see what feels best. Pressure Button £10 – these devices are needed to counteract some of the forces and movement generated as an arrow is shot and deflects with recurve bows. Some recurve risers come supplied with a free pressure button that is suitable for use and does not need replacing until your archery skills are more developed (by which time it is often worn out anyway). Sight £30 – there is a vast range of quality and pricing for sights ranging from a few pounds to several hundred. Top end sights have great stability and very fine adjustments but are only required when shooting long distances. It is recommended that a relatively low budget sight is used initially to minimise outlay whilst allowing the archer to progress to reasonable distances before further investment is required. Stabilisers £15 – these can be added to bow to aid the archer in holding the bow steady as well as reducing the level of vibration, it is common to start shooting a recurve bow without any and then add them later as required. Stabilisers vary greatly in price from £15 for a basic long rod to hundreds of pounds for a complete set up. With an initial recurve bow purchase it is not necessary to buy any stabilisers but at most a low cost long rod can be added to the kit. 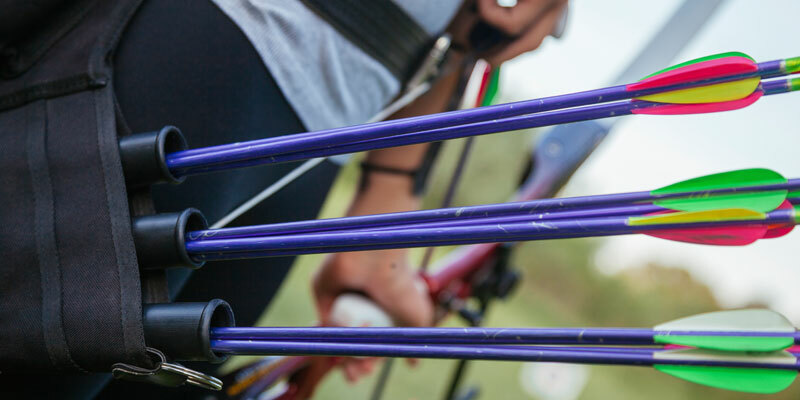 If shooting compound, depending upon the bow configuration it can be a necessity to purchase a long rod in order to be able to use a clip on bow stand. Bow String £7 – (not compound) there are many different materials and visual options for bow strings but to begin with for a modern recurve a ‘Fast Flight’ type string (Such as Fast Flight Plus, 8190, 8125G etc) should be purchased (and not a Dacaron based string). For traditional bows a Dacaron (aka B50 or B55) string should be purchased. Arrow Puller £4 – not quite accurately named, they are lumps of silicone to aid the gripping of arrows to make removal from the target boss easier. They are commonly supplied in 2 forms, a small square that wraps around the arrow or a larger cylindrical body with a slot cut in to fit the arrow. At an introductory level it is a matter of preference which is selected. Bag / Case £35 – to keep the bow and all accessories together and protected, a bow case provides storage for the bow, arrows and ever increasing amount of accessories that archers end up with. Recurve bows are typically carried around in backpacks which include an arrow storage tube and compound bows in hand carried bags. Long sleeves are available for the storage of traditional bows. Quiver £15 – with either its own belt or a clip to attach onto the archers’ belt, the Quiver is used to store arrows and other accessories whist shooting. Available with a wide range of pockets and extra pouches through to a simple arrow holder. Clickers £8 – these are either spring strips or magnetic devices that have the arrow inserted under them until it is drawn back and the clicker is then free to swing back and hit the riser making a clicking noise. Opinion is divided if they should be used during the early stages or archery or not. Clickers help to ensure that arrows are drawn back a consistent distance each time but can lead to problems with archers anticipating the clicker and failing to develop correct and consistent technique. Release Aid £100 – for use with compound bows, the release aid is used to hold the bow string, or a small loop added to the string with the release aid being held and pulled back to bring the bow to the shooting position. The release aid includes a trigger mechanism that releases the bow to shoot the arrow. Beware of cheap release aids as they can have a tendency to misfire, generally the club takes a dim view of people shooting their fellow members, even by accident. Traditional bows are normally shot barebow i.e. they have no sights fitted or other modern aids. There are a selection of traditional bows available and Merlin Archery typically have a range available to try. Long Bows and Flat bows are made from staves of single wood or laminated wood strips and then machined to shape. Whilst they have nostalgia, in reality it is possible to shoot a modern recurve barebow with higher reliability and lower cost. If you are so inclined, it is possible to obtain plans for longbows and flatbows and then make your own bow. Whilst there are a few traditional bows in the club, these are all used as an occasional bow to make a change from shooting a modern bow as opposed to peoples’ main activity. It should also be noted that traditional bows break, hopefully not until they have shot many thousands of arrows. By far the most popular choice for archers and members of the club, modern recurve bows consist of a central riser and limbs that can be dismantled for easy transport and storage. There are three main international manufacturers Win and Win, Hoyt and SF (Sebastian Flute). SF is owned by Win and Win and used as a lower price good quality brand that makes a wide range of bows parts and accessories and is the most popular brand for new club members. Additionally, it should be noted that Merlin Archery also manufacture their own risers under the Mybo brand and are one of very few to be manufactured in the UK. It is possible to buy wooden risers and cheap limbs similar to those used as training bows, however, these types of bow, whilst cheap, are very limited in their capabilities and only suitable for occasional hobby use at short ranges and not considered a good investment for longer term club use where it is normal for people to progress to longer range targets. Most modern recurve bows use ILF (International Lib Fitting) arrangements allowing limbs from multiple manufacturers to be used interchangeably with risers from other manufacturers. It should be noted that some manufacturers, such as Hoyt, have dual product lines, some of which use ILF fittings (their Grand Prix series) and some using their own proprietary fittings (The Formula Series) with some risers having the same name in both ranges. If you choose to buy a bow with proprietary limb fixing systems be very aware that replacement limbs are only available from individual suppliers who may make the system obsolete and equipment costs are generally very high. There have been reported issues over using Hoyt ILF equipment mixed with other brands. Over the first few months of shooting a recurve bow it is normal for archers draw length and strength to increase to the point where many people will change to higher poundage limbs, for this reason it is common to purchase relatively cheap limbs initially and then upgrade at a later date. Wood – in general wooden risers are cheap, low cost items normally associated with training bows. The range of accessories, limbs and adjustments provided is restricted. They can be very cheap to buy at circa £20 and very cheap limbs are also available for around the same money. If you intend to only shoot very occasionally and at short distances such as in back gardens (subject to assessing the risks, having suitably large garden with overshoot area, insurance and some common sense) then a training bow may provide a few years of fun use but if shooting more regularly at a club, a training bow will normally be quickly outgrown and hence is not seen as a good investment. Plastic – there are some cheap plastic risers that some (normally non-archery) shops will attempt to sell as suitable for club use. In general avoid plastic risers and shops that try to sell them as anything other than toys. Aluminium – covers a wide range of risers from relatively cheap to very expensive and is by far the most common riser material you will see used by members at the club. Almost all club archers start off with an aluminium riser in the £80 to £150 range (for the riser) that will provide a good initial bow that will still be adequate after years of shooting. There are members who shoot with relatively low cost aluminium risers at longer distances (for the club) and achieve good results. Carbon Fibre – currently still towards the higher end of the market but Carbon Fibre risers are coming down in price with models appearing at a little over the £200 mark from reputable manufacturers. Carbon fibre risers can be slightly lower weight and will absorb slightly more vibration than an aluminium riser but this will be of little consequence until archers can consistently shoot high scores at long distances. Whilst it does not affect the shooting of the bow, the bow looking good on the shooting line is important to some along with a range of colour matched accessories. Intermediate bows are typically painted or powder coated with more expensive aluminium risers being anodised. Paint – dependent upon the quality of the finish painted bows they can look very smart and normally look better than powder coated finishes. Painted risers are typically more prone to cosmetic damage than powder coated or anodised risers. Powder Coat – when new these risers often look the least attractive as powder coatings tend to be thick and often a little uneven. Powder coating is less durable than an anodised finish but more durable than a painted finish so better able to cope with minor knocks and bumps without chipping and scratching. Anodised – the most durable and often best stock finish for aluminium risers will resist life’s bumps and scrapes but normally is only available on more expensive risers. On most risers it is possible to adjust the draw weight by moving the tiller bolts in or out. There is a limited range of adjustment but most risers are capable of varying the draw weight by circa 4lb which can be useful in making the most out of limbs used whilst building up muscle strength in two stages before moving on to heavier limbs if needed. It is important that the limbs on recurve bows are aligned so that the bow string sits in a straight line from tip to tip whilst centred along the riser. To achieve this there are 2 common methods of adjustment 1) Offset Tiller Bolts – some cheaper and older designs of risers utilise offset tiller bolts whereby as the bolt is rotated it moves from side to side thus adjusting the alignment of the limb. 2) Pocket Adjustment – on some bows the tiller bolts remain in the same position but the small dovetail socket that the limbs second fixing fit in to can be adjusted and locked in position. Whilst both systems can be made to work there is an advantage in having pocket limb adjustment as firstly it simplifies bow setup, but secondly, once set the tiller bolts can be adjusted to vary the bow’s draw weight without having to realign the limbs. Limbs are rated by their draw weight and length, both of which are quoted on the assumption that they will be used with a 25 inch riser. Limbs are supplied in short, medium and long ranging in poundage from under 20lbs to over 70lbs. When using a 23 inch riser the overall bow length will end up 2 inches shorter and the draw weight will be higher than the main figure quoted (typically by 2lbs). Limb draw weights are quoted at a 28 inch draw and hence if an archer has a shorter draw length the draw weight experienced will be less, a longer draw length will result in a higher weight by typically 2lbs per inch of extra draw length. This is one of the reasons it is important to make use of a professional archery shop to get your draw length measured and select appropriate equipment. When choosing the draw weight of your first limbs there is a balance to be struck, if too high a poundage of limbs are chosen there is a risk that injury can occur or that archers will struggle to gain the strength required to use the limbs and give up. Just as choosing limbs that are too powerful will cause problems, if limbs are too weak the archer will struggle to shoot longer distances, will not build up the required strength to progress and will end up having to buy replacement limbs at an early stage. It does depend upon the build and initial strength of the archer, but common starting draw weights are around 28lbs for men and 24lbs for women. At first the archer should be able to draw and shoot the bow for shorter periods of time to build up muscle strength and over a few months will develop the strength to move on to stronger limbs. Limbs vary in price from £25 through to £500+ depending upon the materials used and the manufacturer. There are typically 4 variations of materials used for construction with two different core options and 2 different laminate options. The core refers to the central section of the limb used mainly to provide shape and form to the limbs. The core is laminated with materials that will provide the force and response characteristics of the limbs. Wooden Core – the lower cost limbs are based upon a wooden core and hence is subject to natural variations. As wood is a natural material is can have irregularities and some non-ideal characteristics that synthetic materials do not suffer from. Wooden cores can also be susceptible to changes in humidity and temperature, although this is less of an issue in the UK. Foam Core – more expensive that wooden cores the use of a synthetic foam provides a standardised consistent core that should be impervious to humidity and not subject to significant variations in characteristics at varying temperature. Fibreglass Laminates – Fibreglass is the cheaper of the laminate options, tends to result in lower arrow speeds and will typically be manufactured to a lower tolerance than carbon fibre limbs. Carbon Fibre Laminates – more expensive than fibreglass and claimed to be manufactured to a higher standard with less likelihood of limbs twisting when drawn. Carbon limbs tend to be less prone to stacking (see below). Both of the above core type are available with either of the laminate types and typically in order of cheapest to most expensive are wood core fibreglass, foam core fibreglass, wood core carbon fibre, foam core carbon fibre. For beginners there is little point in buying anything more expensive than wood core fibreglass laminate limbs. One characteristic of limbs to be considered is the variation is draw weight by draw length. All limbs are given a rated draw weight which as standard is measured at a 28 inch draw length. As individual archers draw lengths vary so does the actual draw weight of the limbs in use. As an approximate it is quoted that for each 1 inch of extra draw length (over 28 inches) the draw weight will increase by 2lbs. This figure is approximate but also only valid for a limited amount of additional draw until ‘stacking’ of the limbs occurs where the draw weight starts to greatly increase for smaller increments in draw length. Stacking does not need to be of concern to archers unless your draw length is extending over 28 inches (and probably more like over 30 inches). Archers with a long draw length should have the actual limbs they are thinking of purchasing tested at their draw length and also at one or two inches extra to ensure they are not going to have problems as their draw length increases during the first few months of shooting. As an initial bow there is good reason why most people opt for a modern recurve set up and then further branch out in to traditional or compound bows after getting their technique correct and understanding their requirements. It is possible to buy some very cheap recurve bows with training bows available for £50 excluding arrows and accessories but such bows are likely to be quickly outgrown and then limit the development of an archer. It is possible to spend well in excess of £1,500 on a recurve bow, but despite all of the marketing and manufacturers promises it will not make you a better archer and any need for top end equipment is several years away if ever. Beginners are encouraged to consider intermediate level equipment, some of which will need replacing as you progress (as it will even if you buy expensive initial limbs and arrows) but a lot of the equipment, for most people will never restrict their abilities as an archer. Some purchases are likely to need replacing after a few months such as limbs and possibly arrows as so for this reason the initial purchase should be for low cost versions such as SF Axiom Plus wood / Fibreglass limbs and Easton Archery Tribute or Jazz Aluminium arrows. For risers there are a variety of Aluminium based products in the £100 to £150 range that will in all probability not need replacing for several years if ever. There are members in the club shooting with relatively low cost bows such as the SF Axiom riser and limbs who are able to do so at longer distances with good groupings i.e. the selection of a relative basic riser and limbs will not limit the development of an archer for the first few years. The item of note is that the SF Axiom riser is limited to 40lbs draw weight which for smaller framed archers is unlikely to cause any problem, but archers intending to progress on to heavier weights than this should consider purchasing a slightly more expensive riser such as the SF Premium Plus. Most adult compound bows have a high poundage compared to most recurve bows but have a ‘let off’ feature whereby once the bow has been pulled through its peak power the force required to held the bow string reduces greatly (65% to 80% reduction) which allows more effort and concentration on aiming the bow before release. It should be noted that a lot of the development and production of compound bows is aimed at the hunting market intended for people (typically Americans) to go in to the woods and shoot a variety of natures’ creations at relatively short range as opposed to target shooting that is undertaken at a club. For adult compound bows the minimum axle to axle length for a target bow is generally considered to be 36 inch. The longer the bow the more stability it should have and hence the more accurately it is possible to shoot. It is possible to buy some cheap compound bows from spurious makers, however, it is recommenced that if you want a cheaper set up then go for a recurve bow, if you want a compound bow stick to the known brands such as Hoyt, Bowtech, PSE or Bear Archery. If looking at second hand bows either purchase from an archery shop who can check the bow out prior to selling it, or inspect the bow in person (preferably with someone who knows what they are looking for). A dangerous compound bow can cause significant physical harm if it fails or misfires. Unlike recurve bows which require no changes to accommodate a wide range of draw lengths, compound bows need to be specifically configured for the shooters draw length. On adult bows it is common for there to only be 3 or 4 inches of adjustment in a bow without incurring significant expense in replacing cams. There are some junior bows now emerging onto the market that can cope with a large range of draw lengths and weight such as the Hoyt Ignite. Whilst such bows can be shot by adults they will lack the stability and accuracy needed for target shooting. It is normal to shoot a compound bow with the use of a release aid which grips around the bow string (or a small loop added to the bow string), is used to pull back the bow and then provides a trigger release for shooting the bow. Release aids reduce the force applied to the fingers during the drawing of the bow and provide a cleaner release than finger shooting a bow. Release aids come in 2 main types, firstly there are wrist releases that have a strap fastened around the archers’ wrist and an arm projecting forwards with the actual release that grips the bow string and provides a small trigger leaver for the archer to activate. The second type of release aid is hand held being pulled back by 3 or 4 fingers and providing either a thumb release or a pressure release that will automatically release the bow when the force on the release aid reaches a pre-set limit. Wrist releases are typically considered to be of lower accuracy than hand held releases. Compound bows are purchased as single items i.e. riser, limbs and cams as a complete pre-assembled bow and hence do not lend themselves to be upgraded in parts as is the case with recurve bows. Adult compound bows start at circa £600 for the bare bow, on top of this there are a number of accessories needed including a sight, scope, arrow rest and release aid all of which are also considerably more expensive that the equivalent item for use of recurve bows. As a word of caution, the use of cheap and poor quality components is not advisable with compound bows due to the increase in forces and vibration. Particularly for compound bows, Merlin Archery in Loughborough manufacture some of their own accessories that are good quality and well-priced relative to similar quality alternatives. Fibreglass – cheap and nasty arrows supplied as part of toy kits. Not permitted for use at the club. Pure Carbon Fibre – medium cost, light and fast arrows but are not permitted for use at the club, except for use indoors, as they cannot be detected using a metal detector in the event of a lost arrow. If shot when damaged carbon fibre arrows can also suffer catastrophic failure. Wood – traditional wooden arrows are often used with traditional bows but are unsuitable for shooting from modern recurve or compound bows. Pure Aluminium Alloy – low cost and durable arrows. These are the normal starting arrows but are also used in situations where smaller diameters and arrow speed are not as critical i.e. indoor shooting. Aluminium arrows can take a fair amount of punishment and particularly when starting out and shooting shorter distances are cheap. Aluminium arrows are rated according to a 4 digit number e.g. 1916 or 2315, the first 2 digits are the diameter of the arrow in 1/64th of an inch and the second 2 digits are the wall thickness of the arrow shaft. Aluminium Carbon Composite – the most expensive types of arrow commonly available, starting with an aluminium core, carbon fibre is then wrapped around the outside of the arrow to add strength producing arrows that are smaller in diameter and lighter than pure aluminium arrows. Moving to this arrow construction is not required until shooting longer distances of 50 yards or over when the benefit of faster arrows and smaller diameter (less effected by the wind) starts to make a difference. Fletchings – there are a variety of different shape and size fletchings available including traditional feathers and modern plastic veins in different shapes. Larger fletchings are better at stabilising arrows quickly whereas smaller fletchings reduce drag and help to maintain arrow speed at longer distances. For indoor shooting as a beginner you will be shooting shorter distances and hence are advised to get larger veins such as EP26 size. If you retain the same arrows as you move up to greater distances, it is easy and of trivial cost (a few pence each) to buy smaller fletchings and fit them to the arrows. Nocks and Points – the shop will select the correct nocks and points to suit the arrow shafts you are buying. It is normally worth buying a couple of spare nocks as they do occasionally get broken. Correct arrow selection is critical to be able to correctly shoot the bow. As they are shot arrows deflect depending upon a number of factors including the draw weight of the bow, length of arrow and weight of the arrow point. 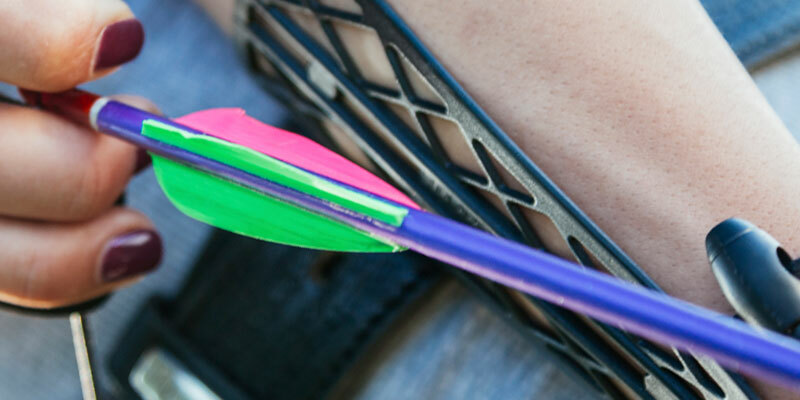 Arrow selections can be made using some of the suppliers’ online tools but the archery shop should be able to select the correct arrows for your bow. As you upgrade limbs to higher draw weights you will probably also need to buy new arrows, additionally during the initial period of learning to shoot a bow it is common for targets to be busy and various shots to hit various items (other arrows, stands, the ground). For this reason, it is advised that low cost alloy arrows are used from a reputable manufacturer such as Easton. If you are shooting a high poundage bow or compound bow you may need to go for the more expensive alloy arrows due to the stiffness required, otherwise go cheap! X7, X23 and X27 arrows are indoor arrows and are not good starter arrows due to price and the effect of the wind on such large diameter arrows outdoors. A set of Easton Tribute or Jazz arrows are good starter sets that can be used both indoors and out whilst minimising cost. Indoors arrows are normally shot in ends of 3 or 4, outdoors it is normal to shoot ends of 6 arrows. It is advisable to buy a minimum of 8 arrows although given the minor cost of starter arrows increasing to 12 is not particularly expensive and allows for more arrows to be damaged / requiring repairs at any one time. As a beginner you are unlikely to have a consistent draw length and will find that having shot for several weeks your draw length increases (sometimes by a few inches) for this reason your first set of arrows should be left a few inches longer than needed. Having longer arrows (within reason) will not cause any significant problems but if your arrows become too short there is a risk that they will fall off the arrow rest and so cannot be shot safely. It is possible to hire a bow from an archery shop selling the Stylist range of bows. Prices can be found on their website http://www.stylist-bows.com and it is possible to rent a bow for up to one year and get the money paid in rent deducted from the final purchase price of the bow. It should be factored in that you will still have to buy some items such as arrows plus the Stylist range are expensive bows and hence the overall outlay, even with the rent deducted, is still high but you can give archery a try with a lower sunk cost for the first few months and then be in a more knowledgeable position to try alternative bows or decide to purchase the Stylist bow. Selecting your first bow is about selecting the optimum value for money, spending enough that equipment will not be outgrown after a short time, whilst resisting the myriad of very expensive equipment that exceeds the requirements of club archers. Visiting a professional archery shop to try a range of equipment, receive professional advice and get properly measured for a bow is important as incorrect and mismatched equipment will lead to frustration and prove a waste of money. Most archers will move up in draw weight far earlier than the quality of lower priced limbs become a limiting factor and hence for an initial purchase cheaper wood core fibreglass limbs are advised. Arrows will probably also need replacing as draw weights are increased and cheap arrows will not adversely affect your archery until shooting longer distances. It is therefore recommended that cheap Aluminium arrows e.g. Easton Tribute, Jazz or Platinum Plus are purchased and that they are intentionally sized to be a few inches longer than initially required. Note that all carbon arrows are not permitted to be used at the club. For risers an intermediate level Aluminium riser such as the SF Axiom Plus, SF Premium Plus, Mybo Rio or similar are good choices that will last the archer for several years (stronger archers do note that the Axiom Plus has a limit of 40lbs draw weight). Look for a riser that uses limb pocket alignment and avoid older models of bows that some shops still have stocks of that use tiller bolt alignment adjustment. As a warning it is very easy to upgrade bow components, especially for recurve, in very small increments of a few pounds at a time spread across multiple bow components to find yourself spending several hundred pounds more than you intended with no improvement in your abilities or skills. Overall, whatever type of bow you choose, you are looking for something that feels comfortable and there is a wide variety of different bows within the intermediate price ranges that you can try and compare. Take your time, ask questions and always test shoot a few bows. Your initial purchase should feel heavy to pull back and will take some getting used to but without feeling excessively difficult. If in doubt, do not buy something you think may be wrong and discuss the options with people in the club.